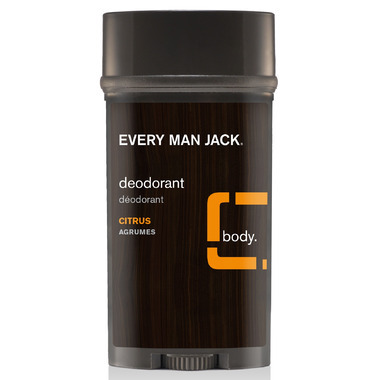 Every Man Jack's naturally derived deodorant provides long lasting odor protection and helps absorb sweat and moisture. All without the use of aluminum or other harsh chemicals, leaving you feeling and smelling fresh and clean. Ahh. What makes it work? Lichen extract and rosemary are natural antibacterial agents that help control odor causing bacteria. Cotton extract and witch hazel absorb wetness. Essential citrus oils of mandarin orange and lemon refresh. Certified organic aloe vera soothes sensitive skin. Great scent! Works very well for my young son's first deoderant. He loves it! Would be 5/5 if it was still ALL natural. Used to love this deodorant, until they changed the formula. It is no longer all natural, they now say they use as many natural ingredients as possible. The new formula does not agree with me and, like most deodorants, I break out into a rash. The search continues. My husband and I both have been using this deoderant but it is hard to find in stores. I love that we can buy our favourite deodorant from Well. The scent is very fresh and can be used for either male or female, it is exactly what it says "Citrus" and the scent is long lasting. We have been using this product for 2 years and happy to continue using it! Great product. Smell is fantastic. Fresh, sweet and uplifting citruses. Works for me almost all day long. I'll buy this one again (not like in case with Sandalwood version! ).